The Guardian reports today that “Police in the UK are planning to use unmanned spy drones, controversially deployed in Afghanistan” as part of a “national strategy developed by arms manufacturer BAE Systems” and “a consortium of government agencies”. You can read the full article here. The “national strategy” to which the Guardian refers is actually the ASTRAEA project, a £32 million ‘public-private’ partnership that has been funded as part of the UK’s National Aerospace Technology Strategy. ‘NATS’, as the strategy is known, is an industry-led government initiative adopted in 2004. By the end of 2008, the initiative had attracted some £464 million in collaborative R&D funding for 70 individual programmes. So while none of this exactly ‘news’, credit to the Guardian for its freedom of information request and provocative reporting. The comments on its article certainly show the strength of feeling against the use of drones/UAVs in the UK. By way of clarification, there are actually two types of unmanned aerial vehicle (UAVs): (i) the armed and unarmed ‘drone’ planes’ to which the Guardian report refers, and (ii) much smaller miniature spy planes. The latter are basically remote-controlled aircraft fitted with cameras and are already in use in the UK and other countries. 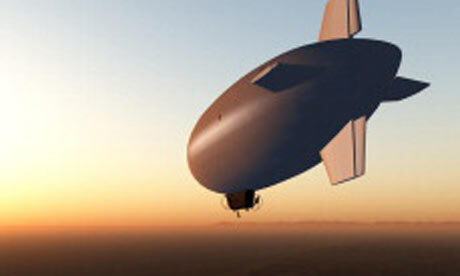 The military drones the Guardian is reporting on are currently prohibited from flying in European airspace because of well-founded concerns about potential collisions with traditional aircraft. The air traffic control community is particularly suspicious, and demands that UAVs adhere to the same safety standards as their manned counterparts, which some argue render UAV systems too expensive to implement. I’d be very surprised if the “sense and avoid” systems for these kind of drones will be licensed in time for the 2012 Olympics, but governments and the aerospace industry are certainly throwing money at the problem and can be relied upon to lobby hard when the technology is in place. You write, “…well-founded concerns about potential collisions with traditional aircraft.” What is meant by your term “well founded?” To date, I’m sure, there have been no collisions of unmanned aircraft with manned aircraft in the UK (or US, for that matter). Traffic density and procedural deconfliction have proven safe provided all concerned are operating on the same page. The very system you show in the picture operates at an altitude well bellow that of manned aircraft. If I were a fireman trying to fight a fire at a chemical plant, I would very much like to have an “eye in the sky” to help me “see” where the most dangerous areas of the fire are located. 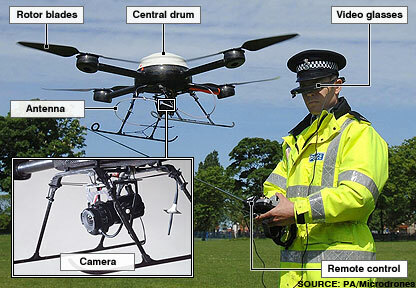 Whether it would be with police or other first responders, the use of unmanned aircraft improves safety for all. 1) the post reads “The military drones the Guardian is reporting on are currently prohibited from flying in European airspace because of well-founded concerns about potential collisions with traditional aircraft”. EUROCONTROL’s position is that: “At present, except in operational theatres, most UAV flights take place within segregated airspace because the lack of an on-board pilot is considered to be potentially hazardous to other airspace users”. Since EUROCONTROL is the primary European Organisation for the Safety of Air Navigation, I trust its concerns are “well-founded”. 2) I include the picture to which I presume you refer in your comment only to make the point that this kind of UAV is already in use (an omission in the Guardian story). Ben (I assume…) – You are right. The post was not about firefighters. If you read my post,however, I mentioned any “first responder.” In the US, that would mean police, fire department, any sort of disaster coordination, etc. Any technology may be used in a nefarious manner. I suppose one has to look at the reputation of institution in control. Are you saying the police make a habit of abusing, for the most part, technology? If such is the case, and the courts are powerless to prevent it, you have a very valid point. God help us, though, when we discount the legal use of available technology, without the data to prove such technology is, in fact, to dangerous, to catch the bad guy.